Humble stews are quintessential comfort food. Braised and slow cooked, they are one-pot wonders infused with deep flavors coaxed from hearty vegetables and meat. These long simmering concoctions are often left for the weekend with stretches of time for cooking. So what to do during the week when we crave equally satisfying and nourishing meals in less than an hour? Quick braising is the answer. This chicken recipe can be quickly prepped and popped in the oven for 30 minutes of hands-free braising. Light yet rich, this flavorful meal will address any cravings for a hearty dinner. Weeknight food never tasted so slow. Keeping the chicken skin exposed while braising ensures that the skin will remain crisp and golden. Preheat the oven to 350°F. Season the chicken breasts all over with salt and pepper. Heat 1 tablespoon olive oil in a deep skillet or wide Dutch oven over medium-high heat. Add the chicken, skin side down, in batches. Cook until the skin is brown and crispy, 4 to 5 minutes, then turn the chicken and cook 2 minutes. Transfer to a plate and repeat with remaining chicken. Drain off all but 1 tablespoon fat from the pot and add 1 tablespoon oil. Add the leeks to the pot and saute over medium heat, about 1 minute. Add the carrots, mushrooms and garlic. Saute over medium heat until the vegetables begin to soften and brighten in color, 3 to 4 minutes. Add the white wine and bring to a boil, scraping up any brown bits. Add the bay leaf, thyme, 1 teaspoon salt and 1/2 teaspoon black pepper. Return the chicken to the pot and nestle, skin-side up, into the vegetables. Pour in enough chicken stock, without splashing the skin, to nearly cover the chicken but not submerge it. The skin should remain exposed. Bring to a simmer. Cover and cook over low heat for 10 minutes. Uncover pot and transfer to oven. Bake until the chicken is cooked through, about 30 minutes, depending on the size of the chicken breasts. Serve in bowls with rice, farro or couscous. A mouthwatering dish! Light and flavorful. Such an irresistible weeknight recipe! I adore the idea of easy with rich, savory flavors greeting the weary as they arrive home famished for dinner! I must try this recipe! Where is your cute pot from? I LOVE it! Beautiful recipe! I’ve always liked braised chicken breasts. Not a fan of dark meat, so this suits my tastes just perfect and it’s quick, too! Chicken braised in the oven is an all time favorite of mine and your recipe reminds me of one my mother used to make. Did the chicken breasts you used have the bone intact as well? I love to cook with bone-in, skin-on but my family often balks. They prefer neither (dry! boring! flavorless!). Using chicken breasts with ribs and skin but no bone seems like a decent compromise, but I imagine the cooking time is different with bone. This looks tasty and warming. Still too cold here in DC! Now that we’re into the remodel, I’m looking for great recipes I can make in the slow cooker, and this would be perfect! 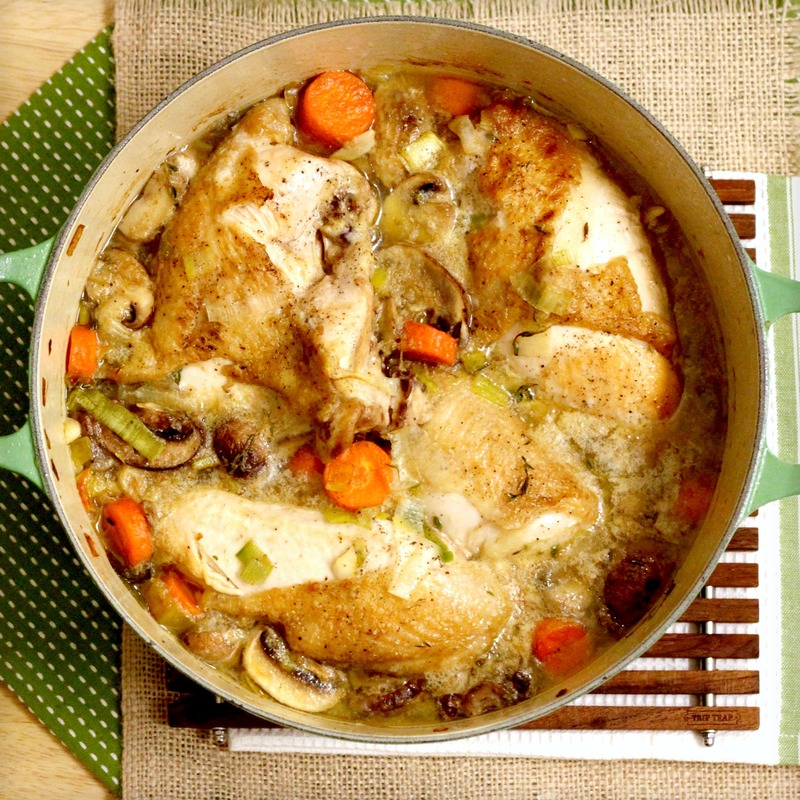 Love this….the deep flavors of a traditional braise in just a fraction of the time.